A HEAVYweight lineup is donating its time and efforts toward raising awareness of the occupation of Tibet by performing at the TIBETAN FREEDOM CONCERT at the Sydney Showground, Homebush Bay, on Sunday, June 13. The lineup includes NEIL FINN, YOU AM I, THE LIVING END, REGURGITATOR, SPIDERBAIT, THE MAVIS'S, CELIBATE RIFLES, NOT FROM THERE, ESKIMO JOE, TRANS AM, JEBEDIAH and GERLING plus others. Tickets are $40, through TICKETEK, all proceeds to MILAREPA FUND. 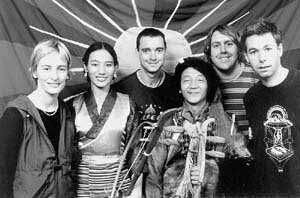 Pictured above are (from left) Janet from Spiderbait, Dawa a Tibetan musician, Whit from Spiderbait, Nyima a Tibetan musician and Kram from Spiderbait.